Even if you are a girl travelling by yourself,you can enjoy secure and relaxing life in Ubud. 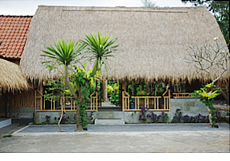 Alang Alang house Ubud is cottage located near Ubud, the island's cultural heart.Our guests can soak up the nature at the cottage and enjoy an endless amount of entertainment in Ubud. In the morning or afternoon, you can surrender yourself to the relaxing treatments and massage on the balcony, and going to Ubud center for dinner or plays by our transportation service. Alang Alang House Ubud is jointly run by Balinese and Japanese so that you can enjoy your stay safely and feel Balinese culture deeply. he family which play host is the head family of the village, Mr.Ketut's. Most of them are female staff and regardless of you are alone, couple, or with friends,they keep your privacy and you can enjoy safe and relaxing stay. *Takes about 5 to 10 mins. A round trip is free. If you'd like to be pick up in the middle of the night, please ask us. Rooms are very cool with natural breeze making a perfectly natural environment to make your stay comfortable. On either hand of the road, there are plenty of shops for several kilometers in which you can do your everyday shopping and make your stay ever more pleasant. and famous among overseas tourists for buying souvenirs and balinese sundries.